Gerard has been reconstructing women’s breasts after breast cancer for many years now, however, “prevention is better than cure” so we decided to raise awareness and funds for a fantastic breast cancer charity called Breast Cancer Now which is committed to researching a cure for Breast Cancer. 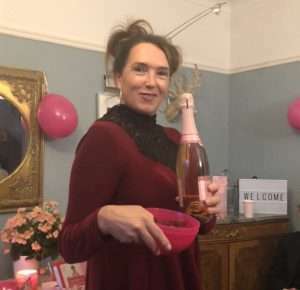 In our experience, the Mums at School, in the road and in the wider community love a chance to have a cuppa, cake and a chat (and some even a glass of fizz! ha) so what made it even better was that we could raise funds and also awareness of checking your breasts in a fun way which is what we did! After seeing and hearing about the excellent work that the Breast Cancer Charity Breast Cancer Now has been doing we decided to support them as it is a cause which is close to our hearts. They provided a brilliant pack of balloons, stickers, posters and ideas to get us and the party started!! We invited friends in the road, our lovely Lollipop lady and Mums from school to the house for a drop in so that they could come and go as long as they liked depending on their busy schedules. After buying prosecco, decorating the room with banners, posters and balloons, and enlisting the girls to help us make a range of chocolate and sprinkle dipped apples on sticks, fairy cakes, banana cakes, cherry scones and a huge slab of fabulous chocolate and cherry brownies we were ready to go. 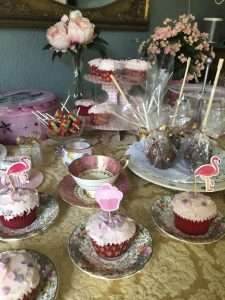 Over the years I’ve collected crystal glasses, vintage ornate gold plates, cups and saucers and a beautiful tea pot which helped to make the occasion special along with some pretty pink napkins and even lacy doilies it really was a vintage theme. 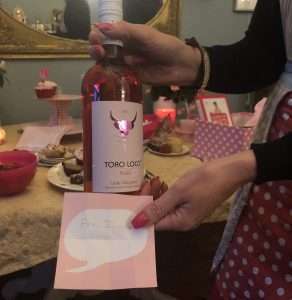 I’d also collected a range of pink prizes over the months of Pink Champagne (a must! ), Rose pink wine, Pink notebooks, M&S cherry chocolate liqueurs and had lovely donations from Hall and Hines which is a local Jewellery and Vegan leather businesss located at M33 Emporium (formerly Traders Outlet) on Tatton Road in Sale high street which makes a range of delicate jewellery and on trend items such as cuffs in silver, gold or rose gold. Our friends at Steele & Co Hairdressers also gave us free Blow Dry appointments at their salons in Sale and Ashton on Mersey, Cheshire. 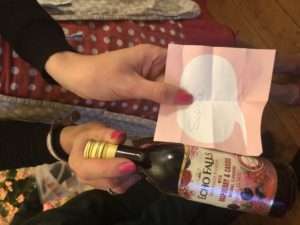 We had a pink prize draw with people donating and putting their names on a pink piece of paper and folding it into a clear bucket and got everyone by taking it in turns to pick out a paper and read the name. A lot of the ladies in the road were very lucky and won a lot! It really helped to have fun and laughter around but at the end of the day the message of “don’t forget to check your breasts regularly”, to promote the research and raise vital funds was serious. The target for the first event was £50 but I am so pleased to say that we absolutely smashed it and raised £142 exactly! Mr Lambe has worked at The Christie Hospital in Didsbury, South Manchester for over 5 years and leads the Breast Reconstruction Unit there. He and his team have seen many women through their breast cancer journey from initial diagnosis, to treatment plans to single, full, partial or double mastectomy and thankfully through to having their breast reconstruction over the fullness of time when they have been in the right place to decide. Many of the patients say that they feel like a woman again after their breast reconstruction surgery and they can go on to live a full and rewarding life again, in fact their lives can sometimes be richer knowing that they have a second chance and can fully appreciate the joy of life. 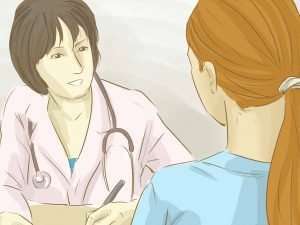 It has been estimated that as many as 1 in 8 women are diagnosed with breast cancer and although treatment is very good, the earlier the diagnosis is made, the better the outcome for the patient. Breast Cancer Now has a great website which answers many of the questions that women have about breast cancer but it is important to self-check as part of your own health and wellness regime of self-care. The photo above is provided by another brilliant charity CoppaFeel who has a mission to inform women on how to check their breasts in a fun way and they are doing a fabulous job! If you see or feel any of the changes above, please don’t hesitate to make an appointment with your GP. The chances are that you are OK, but if you do have a warning sign then the faster you are treated, the better your chances of recovery. Check Your Breasts for any changes every month, you could try checking them on the 1st of every month for example, add it to your diary so when the 1st of the month comes, you will automatically check your breasts and this will become routine over time. Where Should I Check my Breasts? Gerard sees hundreds of women about their breasts whether they want to simply improve them by having a breast enlargement, breast reduction or breast uplift or after cancer when they are ready for a breast reconstruction of one or both breasts. We would like to thank friends and the community for supporting our little event and for the kindness of two local companies, Steele & Co Hairdressers and Hall and Hines who have been so generous.